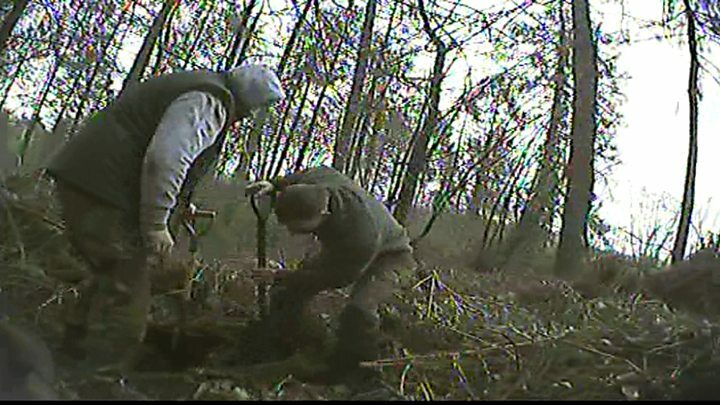 An investigation by BBC Wales Investigates has exposed a secretive network of illegal hunters in south Wales.The programme team went undercover with two badger-baiting gangs as part of a six-month investigation.Wearing a hidden camera "John", a former special operations soldier, infiltrated one group to reveal the criminal activity of badger digging and lamping, where wild animals are torn apart and the hunters' own dogs are often abused.I've had some experiences in the military that I thought would prepare me for dealing with this and I knew there was going to be some violence towards these animals but what I saw was shocking.To these people, killing animals is a sport - the more brutal, the better. The BBC team was able infiltrate the gangs using social media. They had discovered that convicted badger baiter Christian Latcham from the Rhondda Valleys, south Wales, was active in online groups for legal hunting with dogs. He then put them in touch with another man - Tomas Young, 25, from the Gwent Valleys - who invited us out on what turned out to be illegal hunting trips. The gangs are mostly working-class guys in their twenties. They use social media like Snapchat to organise digs and share pictures. These people are very suspicious and guarded. There were a number of occasions where I was questioned quite heavily about my background.They asked if I was an undercover police officer or if I was wearing recording equipment and I had to use my skills to try and persuade them that that wasn't the case. I didn't feel afraid as such but I got the feeling that if I'd have been found out, it might have turned nasty. I feared they might have used the dogs to intimidate me. I went with them three times to try to capture evidence.The first time Tomas invited me "lamping" - hunting at night with high-powered torches - in the Forest of Dean. I didn't know at the time that this would be illegal hunting.But on the way there, they started talking about the types of animals we were going to see - deer, boar, possibly some foxes and maybe even some badgers if they were out. They said there would be "loads of guys" out hunting that night and that they knew of gangs that came from as far away as Newcastle to go lamping in the Forest. Tomas and another man - Ryan Harrison - had three dogs with them - one which was big, quite aggressive-looking, with a pit bull sort of setting and two lurcher-type dogs. We went into a field and Ryan shone the lamp at some deer - I could see about six to eight pairs of eyes in the dark. The dogs immediately started chasing them down and the two men were getting really, really excited.One deer ran straight into a fence and got trapped. One of the lurchers had it by the back legs and was trying to drag it back through the fence.There was an awful noise, the sound of the deer screaming, trying to get away.At this point, Ryan jumped on it, and started to struggle with it but the deer kicked him in the face and at that point he let go. The deer ran off and managed to escape from the dogs but without doubt it was injured and was in awful pain. Ryan had been injured - he had damage to his mouth where the deer had kicked him and his hands were also hurt but to him it was all part of the sport and the injuries were badges of honour.The night was about to get even worse.We drove to another area, where we spotted some wild boar. Very, very quickly, the two guys and their dogs were out of the vehicle and ran off chasing the boar. I chased after them and when I caught up with them, the scene in front of me was horrific. One lurcher was on the back end of the boar and the bull cross dog had latched onto its snout.There were horrendous screams. Ryan was trying to drag the boar down and the animal was really strong, kicking out, fighting for its life. Tomas then pulled out a large knife and started stabbing the boar. It died in front of me. It seemed to make the men quite frenzied.Tomas even filmed himself stabbing the boar on his phone and played it back in the car afterwards. I'd never seen anything like it before; somebody hunting down and killing a wild animal like that, just to see how tough and violent their dogs could be. It's a badge of pride to have an injured dog which carries on fighting.The boar's carcass was hidden in undergrowth and Tomas told me that "one of the boys" would pick it up later. I also went out with Tomas and some other men on a couple of badger digs, which is where they send a terrier into a badger sett wearing a transmitter collar so they locate it in the sett from above ground. Once they hear that it's found a badger, they will dig down into the sett so the other dogs can pull it out and fight it to the death. The first time, they didn't get anything, despite them digging for around eight hours. Tomas got frustrated with his dog because although it seemed to have found a badger, it hadn't latched onto it and let it get away. He was getting quite a lot of ribbing from the other guys in the group, saying his dog wasn't tough enough. That's what really gets to these guys, if their dog isn't aggressive enough and doesn't immediately go down and attack the badger - they think that's a reflection of them as a handler.What they want is to see the dog come back out with injuries on it because that's a sign of a tough dog.They then photograph these dogs - with their injuries - and share the photos with other illegal hunters with a view to breeding them. On the way home, Tomas told me he was disappointed with his dog's performance. Then he told me he'd shot dogs before when they hadn't worked in the way he'd wanted them to.The litters of prized working dogs can go for quite a bit of money - a few hundred pounds a pup. The second time, I went with Tomas and Ryan up towards the Forest of Dean area again, and quite quickly they found a sett. You could hear some growling from the dog that was underground so they started digging down and they could see the black and white fur of the badger. They thought this was an adult so sent one of the bigger lurcher dogs into the ground to pull it out. Two dogs eventually dragged it out but it was a cub. It had no chance and within seconds it was torn apart. Ryan took it off the dogs and threw it on the side. They weren't happy it was a cub because they don't put up much of a fight and the whole aim of this exercise for the badger baiters is for their dogs to have some credible combat; a proper fight with an adult badger who could do some damage to the dogs. They were going to leave this cub, but I saw it was still alive, it was still breathing and I had to tell them to put it out of its misery. I thought I was going to blow my cover then because that could have been something that alerted them that I wasn't 100% the way there were, as much as I was trying to act like I was. It was difficult to see how these men treat their dogs; some of them were kicked or dragged and there was a lot of abuse thrown at them. You could see the dogs cowering at times, it appeared they were afraid of their owners. It's very common to have the bottom part of a dog's jaw being damaged or ripped away in a fight with a badger.But when dogs come out of the setts on the digs I filmed they would turn them around and push them straight back in to carry on looking for the badger. Generally badger baiters don't take them to vets with their injuries because that would be recorded and reported so they stitch up their wounds themselves. They are valuable dogs for hunting and breeding so they're a commodity to them and they'll protect the commodity but they don't have any concern about the feelings of the animal. And they're quite happy to dispose of them once they're no longer a useful commodity.Tomas told me he had shot dogs before which hadn't performed properly on hunts. My lasting feeling after being undercover with these people is that what they are doing is just horrific. It was far, far worse than what I expected to see. They don't care if the animals they kill suffer; they're just killing them for sport. Exposed: The Secret World of Badger Baiters on BBC One Wales at 22:35 and on BBC iPlayer.